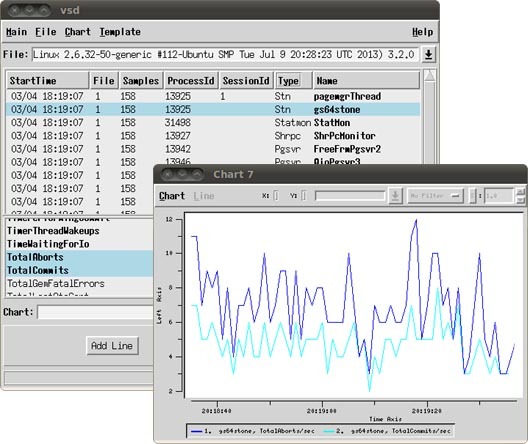 Visual Statistics Display (vsd) is a graphical tool that allows you to view statistics generated by the GemStone/S 64 Bit or GemStone/S server, or by GBS. VSD allows you to monitor performance, in a live system or offline, and can help diagnose many kinds of problems that may occur in complex systems. VSD is distributed with GemStone/S and GemStone/S 64 Bit on UNIX, Linux, and Mac platforms, and with Windows in v.3.2 and later. GemStone server Windows client distributions on earlier versions do not include VSD. VSD can be used under the license terms covering any GemStone/S 64 Bit, GemStone/S, or GBS product. For a list of VSD versions 3.5 and later, and the release notes describing changes in each version, see the Release History and Table of Release Notes. VSD v5.4 is the major release of the VSD product, with a number of new features. VSD v5.4 can read data produced by GemStone/S 64 Bit, 32-bit GemStone/S, and GBS, including data produced by earlier versions of these products. For documentation, download, and other information on older versions, refer to VSD versions. Bugnotes describe bugs and unexpected behavior in versions of GemStone software. Refer to these bugnotes regularly to be sure you are aware of issues you may encounter.